The Long Halloween is one of the most revered of all Batman’s tales, and for good reason too. Jeph Loeb and Tim Sale’s breakout story proved to be a delectable delight to Bat-fans everywhere upon its release, utilising noir-esque elements and rooting the narrative firmly within a murder mystery to great critical and commercial success. The storyline has (along with Miller’s superb Year One), come to define the early years of the Caped Crusader’s crime fighting career, and has managed to both re-envisage and re-invigorate some of the most renowned supporting characters to have graced the pages of DC’s finest. Undoubtedly, The Long Halloween has become enshrined in the upper-echelons of Batman’s iconic bibliography, and it is with no surprise that the tale continues to receive new editions to this day. 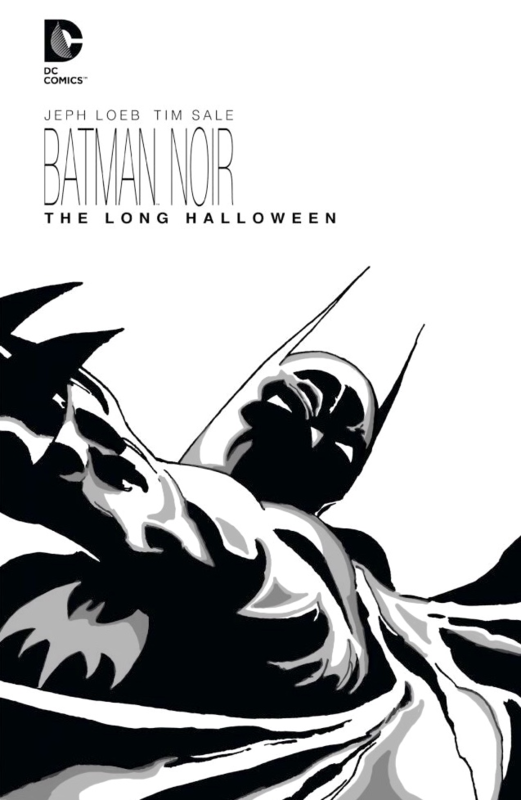 Thus comes Batman Noir, a new line of reprints that remove the colour from these tales, but this in no way makes The Long Halloween lose any of its vibrancy; it has the exact opposite effect. Tim Sale is an artistic heavyweight when it comes to comic books, and his pencils are only elevated by the colour pallet being limited to a Black & White colour scheme. The Long Halloween’s colours were always muted and murky, and whilst that may have always added to its charm, the lack of blues, greys and browns compliment Loeb’s narrative far more effectively. The lack of colour contributes to the sense of desperation and hopelessness evoked by Loeb’s script in a way the previous pallet couldn’t. Some may say that I’m placing too much emphasis on the effect that colour (or rather lack of) has on a comic book script, but I would implore those who do so to not underestimate the way in which colour can effect a narrative. Not only does the black and white serve to compliment the story, it also distinctly sharpens Sale’s pencils and places his art right at the forefront of the novel itself. Reading The Long Halloween: Noir is a completely different experience to reading the original print, and I would say offers a superior package to the original as well. To put it bluntly, Batman Noir is a master-stroke. No, I’m not yet done lauding over Sale’s art! (you thought you would get away that easy, did you?) 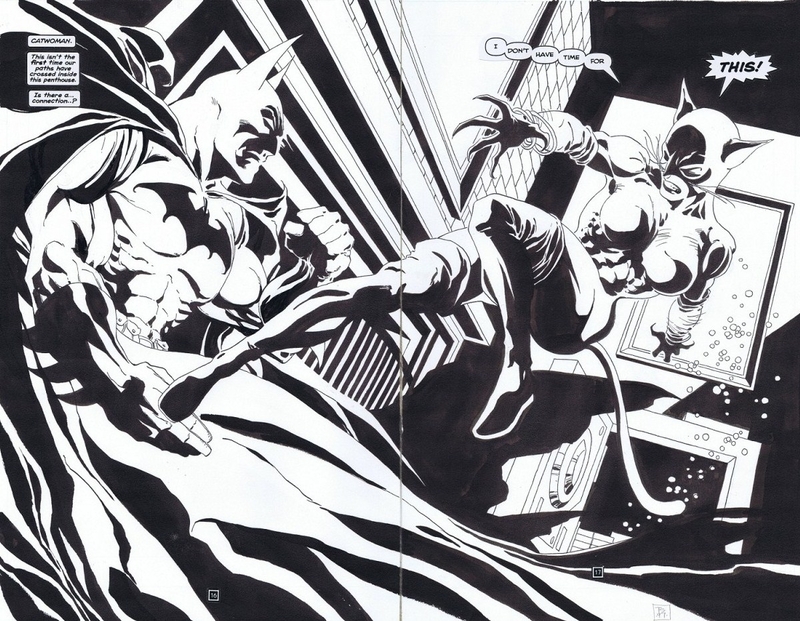 The imagery created by Sale ranks among the most famous of Batman’s distinctive iconography, with the artist being placed firmly within the ranks of the most talented to have had the pleasure of orchestrating a panel featuring The Dark Knight. 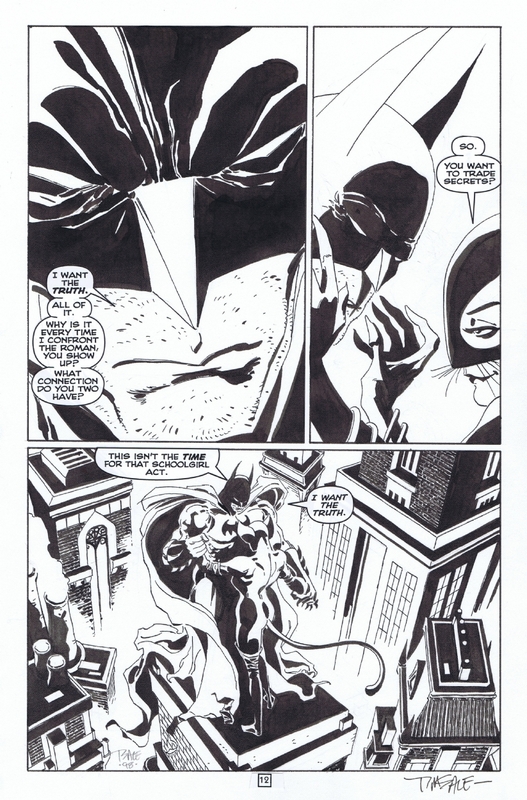 Indeed, there is a reason why Sale is ranked as one of the artistic greats of Batman, and his pages have never looked better, despite the occasional hiccup. Among the Noir editions greatest assets is its paper quality, with it receiving a nice thick upgrade at the expense of the lack of colour. The edition really does look gorgeous, and as a neat little bonus includes a set of sketches pencilled by Sale whilst he was working on his initial panels - a brilliant addition for those who wish to absorb all there is to see of Sale's art. All this and more makes the Noir Series a line Bat-fans will have to keep a keen eye on, with Frank Miller’s famous The Dark Knight Returns receiving the black & white treatment next year. I am immensely intrigued at the prospect of reading Miller’s work in black and white, and I am positive that the tale will be just as enjoyable without colour as it is with it. Here’s hoping that DC continues to give the ‘noir’ treatment to the best of Batman for a while to come! I have to say, the black and white artwork looks very cool indeed - it makes it a lot easier to appreciate Sale's fantastic line work here, as the colours in the original, as you said, are very murky, so this is a nice twist on it. Black and white is a nice touch,but i prefer the color version.The fancy colours and images are some of the reasons we love comics. johnsyggel wrote: Black and white is a nice touch,but i prefer the color version.The fancy colours and images are some of the reasons we love comics. But would you not agree that colour (or rather the lack of it) can impact heavily on a narrative? There are a lot of gorgeous scenes in the noir version that I haven't been able to scan is all. It works best in the more subtle small-scale scenes. Great review ! I didn´t know there was a B & W edition of this comic , it looks fantastic ! I may sell my original colored version and get this one ! Cool review, honestly. These "Noir" books arent very "Noir-ish. They are just Black and whites. Wouldnt it look better with grey tones like The Walking Dead comics do? The Scarred Side wrote: Cool review, honestly. These "Noir" books arent very "Noir-ish. They are just Black and whites. Wouldnt it look better with grey tones like The Walking Dead comics do? Yeahh , that looks really cool !